I love, love, love this recipe. This is a throw together recipe, so just chop, mince, grate, tear, and toss together. You can't go wrong no matter what. It makes great leftovers if you overdo - yes, you will want to overdo! Rinse swiss chard and pat dry between clean towels or paper towels. Cut the stem from the leaves, going up into the leaves until it starts to thin out. Slice the stems into half inch pieces. Stack the leaves and slice across the leaves in one inch ribbons. Rinse brocolli and shake out any excess moisture. Cut the florettes into small pieces. Slice leeks into thin slices. If you’re adding chicken or other protein to the dish, tear or cut it into appropriate-size pieces. To prepare this Healthy Swiss Chard and Garlic Vegetable Saute you’ll need a large saute pan or wok. Begin by melting a half stick of butter in a large saute pan over medium heat. Since all the vegetables do not cook at the same rate, add them to the saute pan one at a time. Add onions and toss frequently until they start to get a little bit limp, add the sliced leeks, stir and toss until the leeks soften. Next, add in the stems of the Swiss Chard as they take a little longer to cook than the leaves, followed by the minced garlic. Keep stirring and tossing to flavor the medley of vegetables. Remember that pot of water boiling away? 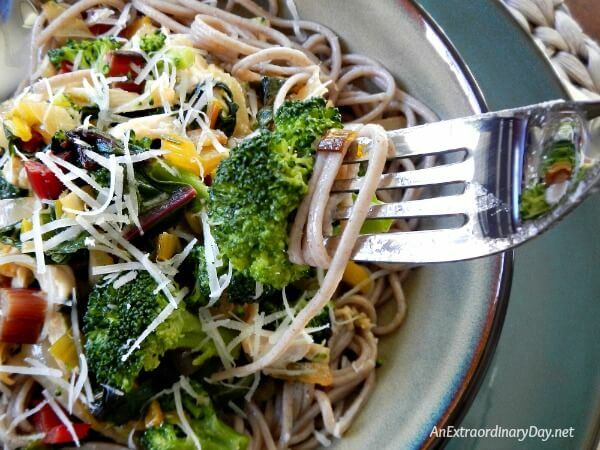 Now is the time to add your soba noodles and a heaping teaspoon of Celtic sea salt. The noodles take between 5 and 7 minutes. Watch so you don’t over cook them. Follow that up by adding in the sliced leaves of the swiss chard, stirring and tossing until they are limp. Once the chicken has been warmed in the dish, liberally pour olive oil over the vegetable medley, sprinkle with sea salt, and toss to mix well. Drain your soba noodles. Place on serving plates or in a bowl. Top with the vegetable mix. Grate Pecorino Romano cheese on top. Add a few twists of freshly ground black pepper.